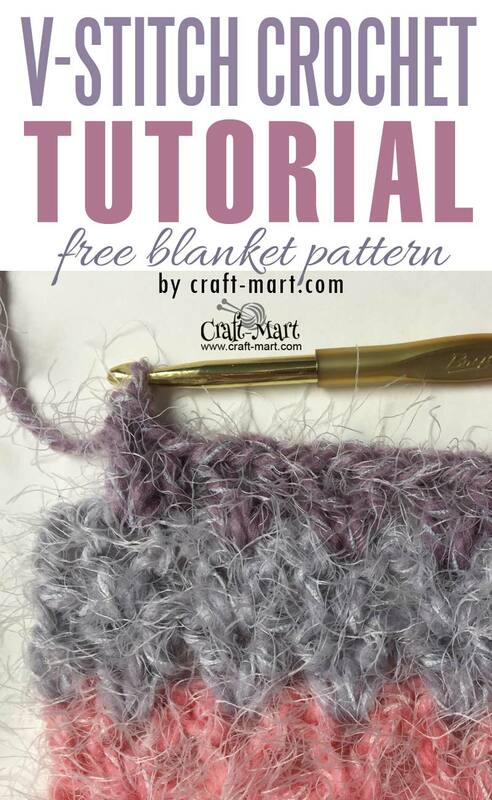 Do you want to learn how to crochet V-stitch blanket? No matter where you are in your crochet journey, it is fun to learn how to crochet V-stitch. It is a great stitch for your toolbox. 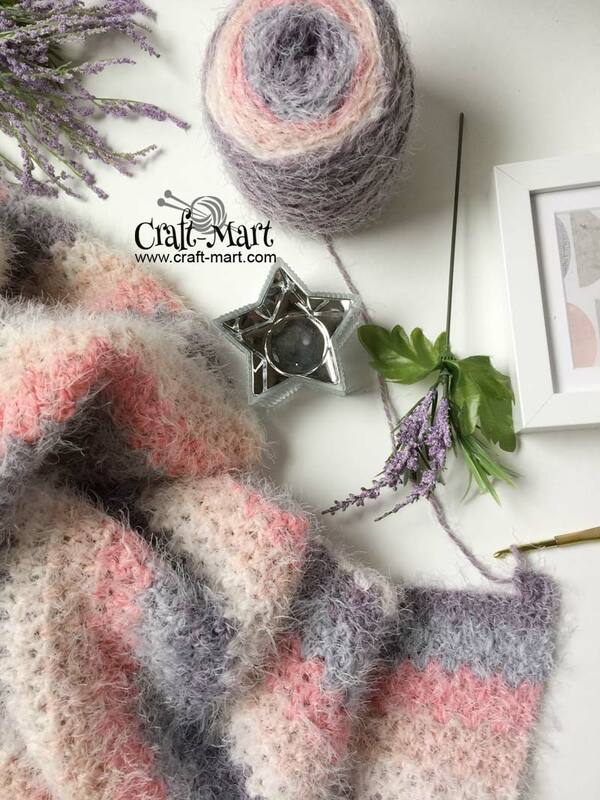 You’d be surprised how suitable it is for many DIY crochet projects such as scarves, crochet V-stitch baby (or toddler) blankets, or cozy wraps. Do you want to learn how to crochet? Check out these free crochet patterns – you’ll love them! 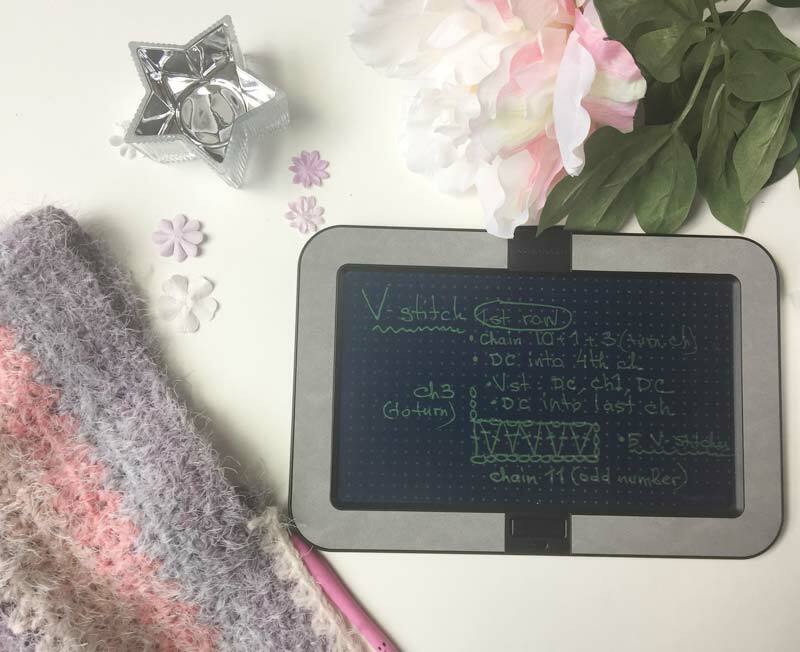 Likewise, V-stitch is such an easy beginner crochet pattern that you can master it in no time. Consequently, if you learned how to crochet double crochet stitch (US), crochet V-stitch will be a breeze. There are lots of cute and cozy crochet baby blankets patterns available. Sometimes, you need a slightly bigger blanket as babies grow so fast. That’s why I’m so excited to share this free pattern for an easy crochet toddler blanket done with easy-to-learn crochet V-stitch. It is a quick pattern for Caron Latte Cakes if you are lucky to have this amazing yarn in your stash. I’ve fallen in love with Caron Latte cakes so this is another beginner-friendly pattern for this soft and cozy yarn. As a matter of fact, I’ve used it in a few crochet projects and loved it. The best way to learn to crochet is by doing it. First, grab a crochet hook and some left-over yarn and let’s do a practice swatch so you can quickly learn how to crochet a V-stitch blanket. 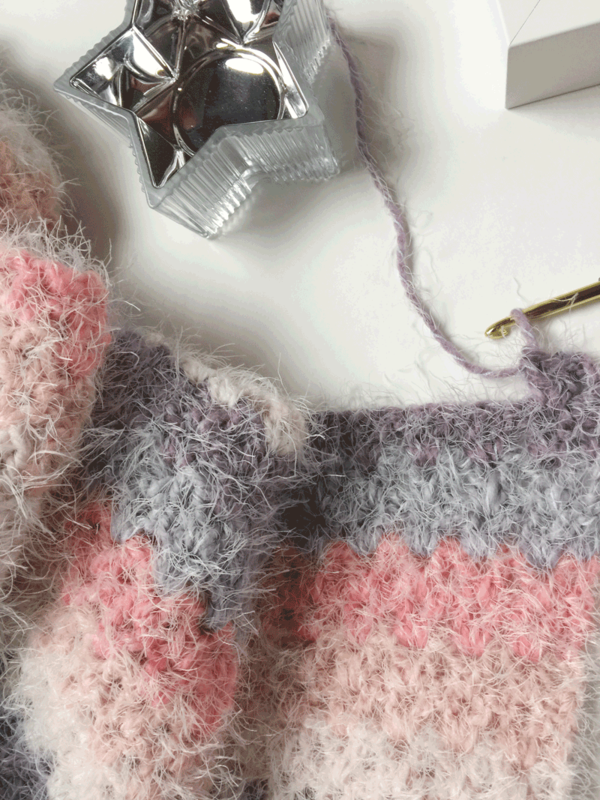 What is a double crochet V-stitch? To accomplish each V-stitch, make one double crochet stitch, chain 1, and then do another double crochet stitch into the same stitch (or space). Consequently, it will create these characteristic multiple Vs that form this basic but distinctive crochet stitch. There may be a variation of this crochet V-stitch – just add one or two chains in between the Vs and you’ll change the look of your crochet pattern. It will have more spaces and look airier. 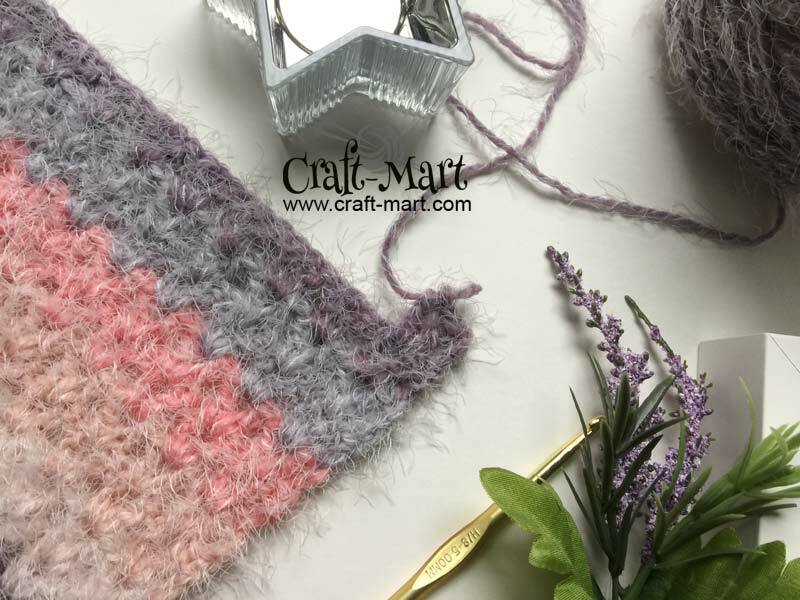 Make a note, it is a perfect stitch for a quick crochet V-stitch blanket or throw when you are in a hurry to create a special hand-made present for a baby shower. Crochet V-stitch is also one of the easiest among basic crochet stitches. How to crochet V-stitch step-by-step? To crochet our practice swatch, chain 11 + 3 (counts as double crochet). You can chain any odd number plus 3 for a practice chain. Double crochet (DC) into the 4th chain from the hook. Double crochet (DC) into the same 4th chain from the hook. Now you have successfully crocheted 1 V-STITCH with ch1 between 2 DC (DC, ch1, DC). To continue with the pattern, skip 1 ch of the foundation chain, DC into next chain, ch1, DC into the same chain – 2nd V-STITCH done! Continue to the end of your practice chain, crochet 1DC into the last chain. You will have 5 V-stitches with 2 DC at both ends. Chain 4 (this is a turning chain), turn. DC into the 1st chain space, CH1, DC into the same chain space (V-stitch). Continue to crochet V-stitches to the end of the row. DC into the top of the turning chain. Repeat row 2 until you are completely familiar and comfortable with the stitch. Now you are ready to crochet V-stitch blanket. That’s all it is to it! As you can now see, you can learn how to crochet this basic stitch very quickly. Best of all, with the same row repeat, it is very easy to crochet the whole blanket as you don’t have to follow any complicated instructions. Noteworthy, crochet V-stitch pattern is truly a versatile pattern as it is reversible. This makes it a great crochet stitch for a plethora of crochet creations such as scarves, beanies, hats, ear-warmers, headbands, blankets, and wraps. Most importantly, V-stitch is one of the greatest crochet stitches for blankets. Among all basic crochet stitches, I probably love it the most. 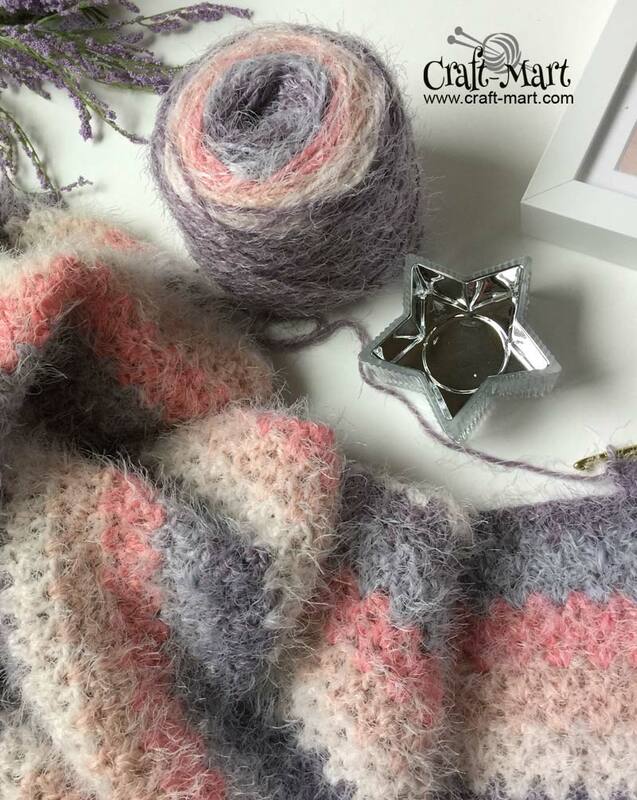 It is so easy to learn and it works very quickly so your blanket can be done in a weekend or so, depending on how much time you have to work on your crochet. At last, now you are ready to learn how to crochet V-stitch blanket. For this project, we used Caron Latte Cakes yarn. It is amazing how well Caron Latte Cakes yarn works with this simple V-stitch pattern. Two rows of V-stitches are perfect for each self-striping color change. If your tension is a little off or Caron Latte Cakes yarn has slightly longer yarn stretches between the colors you can do a simple adjustment. Just start your next row with a new color and weave in the ends later. 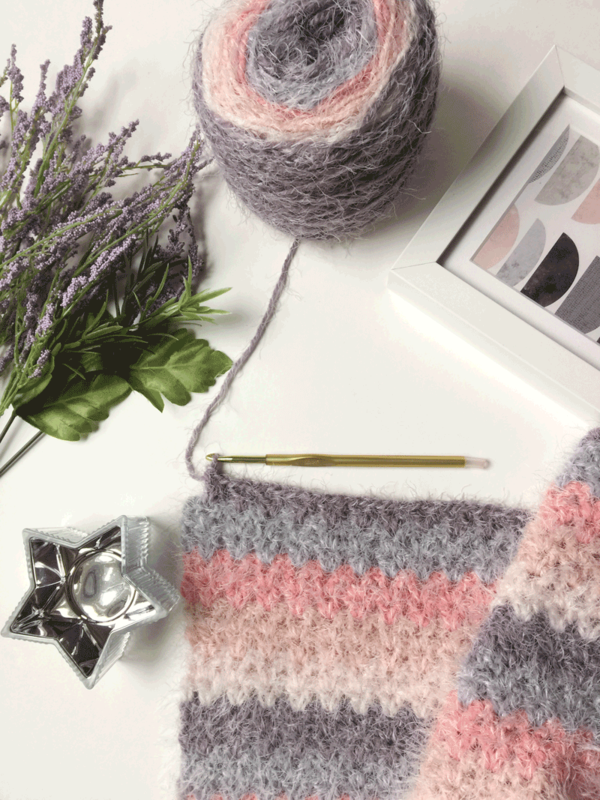 Though it seems slightly more work, it will make your V-stitch blanket stripes look just perfect. Though the label for this yarn calls for 6.5mm (US size K) hook, I’ve used 5mm (US size H) crochet hook as I loved it slightly tighter for this V-stitch crochet blanket. If you don’t have Caron Latte Cakes yarn in your stash, you can use any bulky (size 5) yarn in your preferred color. It doesn’t even have to be self-striping. 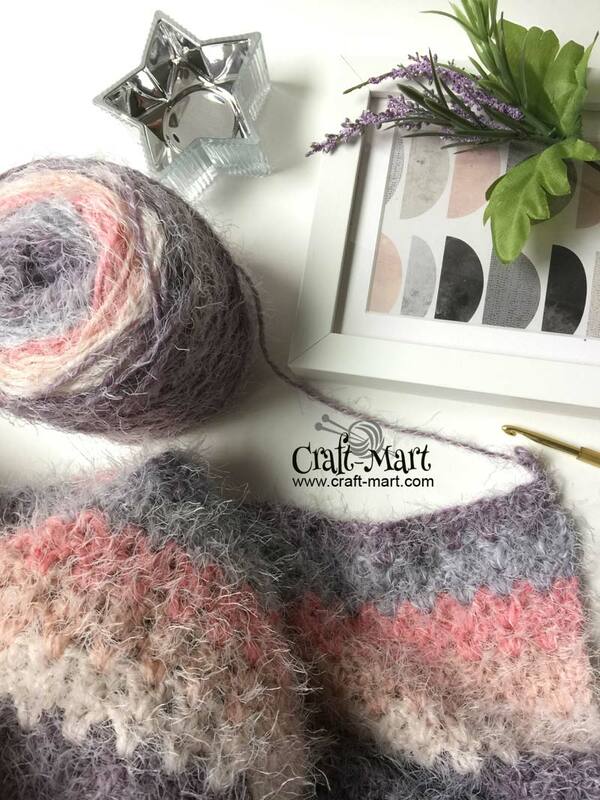 You can use sold color yarn as the pattern itself adds lots of texture to the blanket or alternate 2-3 colors that will go best with the kids’ room decor. Our pattern for this toddler-size crochet blanket has 61 V-stitches across. Is finished size is 43″ x 64″ and we used 4 skeins of Caron Latte Cakes yarn in Plum Fresh. 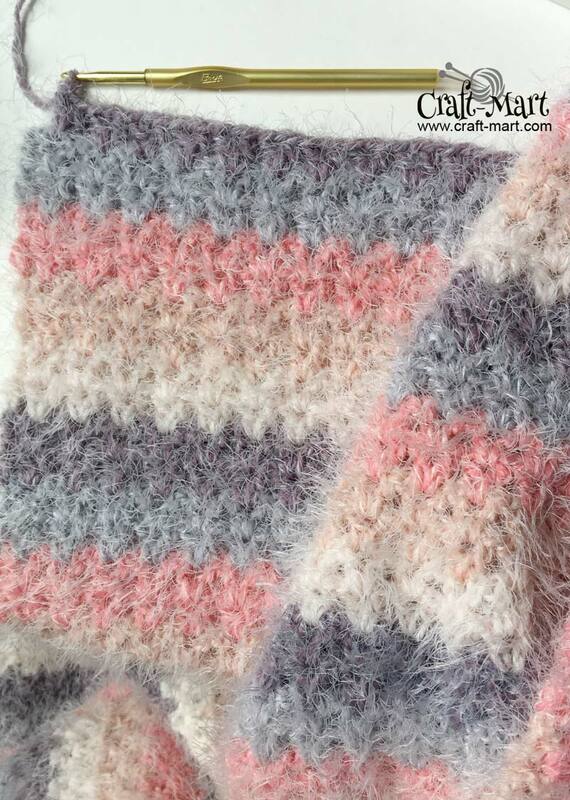 It is a self-striping yarn similar to the original Caron Cakes but with an added touch of softness. 4 skeins of Caron Latte Cakes yarn in Plum Fresh or any other bulky (5) yarn – total weight 35.2 oz (1000 g), 2120 yards (1940 meters). DC into 4th chain from the hook, CH1, DC into the same chain (V-stitch), skip 1 ch, 1Vst into next chain, continue to the end of the row, 1DC into the late chain. Chain 4. V-st into the first chain one space and all other ch1 spaces until the end of the row. Basically, you crochet V-stitches on top of the V-stitch from the previous row. DC into the chain 3 of the turning chain. Simplified version: DC into the last ch space between the V-stitch and the last DC of the previous row. It is a little easier for beginners as it is faster to find the chain space than the third stitch of the turning chain. Just make sure that you continue in the same fashion so all your rows look similar. Repeat row 2 until you use all the yarn or reach desired blanket (throw) size. Make sure you have enough yarn for the last two rows of V-stitches for a uniform look. Mine was slightly short for the last color stripe to make 2 rows of V-stitches, so I cut it off. Secure all the tail ends and weave them off. 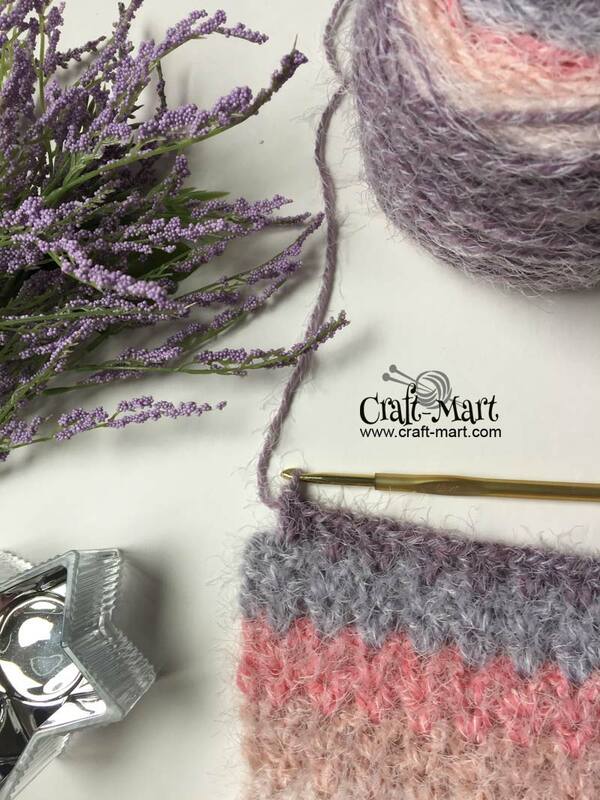 Whether you are just learning to crochet or are a seasoned crochet aficionado, it is really easy to make mistakes. We all do but don’t be scared. Just learn how to avoid them in the first place or how to fix them quickly and efficiently. One of the common mistakes in this pattern is to make only one V in the V-stitch instead of two. This mistake would be easy to catch and fix if you check your work often, every 20-30 stitches. Most importantly, check the whole row carefully before you turn and start a new one. Trust me, it is not a great feeling when you notice a mistake after several rows of crocheting. It would mean that if you are a perfectionist, you would have to undo quite a big chunk of work. It is a natural way in the process of learning crochet (or any craft) but may be upsetting for a beginner.